Kimi Raikkonen is heading back to Ferrari for at least two seasons from the beginning of 2014. He’s leaving Lotus, a strong team who are probably headed for third or fourth in this year’s Constructors’ Championship. While it may look like Raikkonen’s move back to Ferrari is a step forward, as Ferrari are presently (and historically) more competitive than Lotus, the reality is in fact much less certain. Raikkonen has taken a substantial risk by signing for Ferrari. In fairness, remaining with Lotus would also have been risky, as would signing for any other team. That’s because the 2014 technical regulations are significantly different to those in place at present, which means no-one really knows who will be competitive come the start of next season. Consider the example of 2009 (the last time there was a major technical regulation change), when the Brawn team rose from the ashes of Honda (who had a fairly ordinary F1 record) and won both championships to the great surprise of everyone, including themselves. Big budgets are important in Formula One in the long-term. That’s one of the reasons why Mercedes (who took over Brawn) were unable to repeat the astonishing successes of 2009, despite reuniting Ross Brawn and Michael Schumacher – Mercedes did not have the budget or the structure to compete with Red Bull, Ferrari and McLaren. But in the short term, when technical regulations change drastically, innovation is more important than budget, as a single brilliant idea (such as the double diffuser that Brawn used so successfully in 2009) can make the difference between winning by a huge margin and struggling at the back of the field. Of course, ultimately a team with more resources can react to their competitors’ innovation and catch up through rapid development. That’s one of the factors that has led Red Bull to such dominance from the second half of 2009 until now. Ferrari have a massive budget, possibly the largest in Formula One. 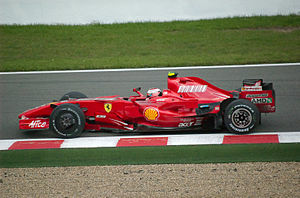 They have produced race-winning (but not championship-winning) cars for the past five seasons (the last Ferrari title was the 2008 Constructor’s Championship). In the long term, Ferrari are sure to make a return to the very top of Formula One. But Raikkonen is only guaranteed two years with the team. That might not be enough time. At Lotus, Raikkonen will have been involved in development of the 2014 car. He has been working with the engineers and management since the beginning of 2012 and is comfortable in the team. Lotus have produced strong cars for the past few seasons and are still in the hunt for further race victories this year. Raikkonen is giving up that strong and competitive environment to head to Ferrari, but he cannot have any concrete idea of how competitive Ferrari will be in 2014. Furthermore, Ferrari are in the hunt (just) for both the Drivers’ and Constructors’ Championships in 2013. As a result, they are still developing their 2013 car aggressively in the hope that they can close the gap to Sebastian Vettel and Red Bull before the end of the season. The resources that are currently going into 2013 car development are not being used to develop the 2014 car. Lotus, by contrast, are no longer realistically in contention for either title this season. They are free to pour all of their resources into developing a strong 2014 car, without having to worry about losing out in 2013 as a result. It would be a massive stretch to call Raikkonen’s switch to Ferrari a bad move. It is probably a good move, from the perspective of Raikkonen’s championship chances in the next two seasons. But considering that the move coincides with major regulation changes, Raikkonen has taken a substantial leap of faith, by going from a team in which he is currently competitive to a team that might or might not be competitive next season.